Klaus Bru (卡 = pronounced Kaa) is one of only a few saxophonists performing exclusively on the rare C-Melody and C-Soprano saxes. German born Klaus Bru has traveled widely, for real and in music. He brings in the folk music of the world (typically from Eastern Europe and Turkey), Avant-garde ridden improvisation concepts, air sounds and electronic noises, strange meters and odd tempos, plus tangible melodies over the moving chords of jazz standards or his own compositions. Klaus Bru has performed and recorded in Europe, Asia, and the U.S. with such diverse musicians as Franz Hautzinger, Peter Herbert, Bilal Karaman, Shih-Yang Lee, Michael Moser, Sunny Murray, Marc Ribot, Martin Stepanik, Sabu Toyozumi, Chaoming Tung, to name just a few. Currently, he shares his time between Vienna, Taipei, and Beijing. Born in Chicago, Sorensen has performed and recorded with jazz artists such as Scott Hamilton, Keith Tippett, Herb Geller, YuYing Hsu, Martin Zenker, and rock and folk artists such as Amy Allison, Neil Cleary, Jerry Joseph, Megan Peters. Sorensen has recorded and toured internationally both as a drummer, and as a singer songwriter/guitarist. He released his solo debut, MIDWEST, in 2012 on City Creek Records. Sorensen has lived in New York City, Edinburgh, Berlin, Chicago, and currently lives in Taipei. 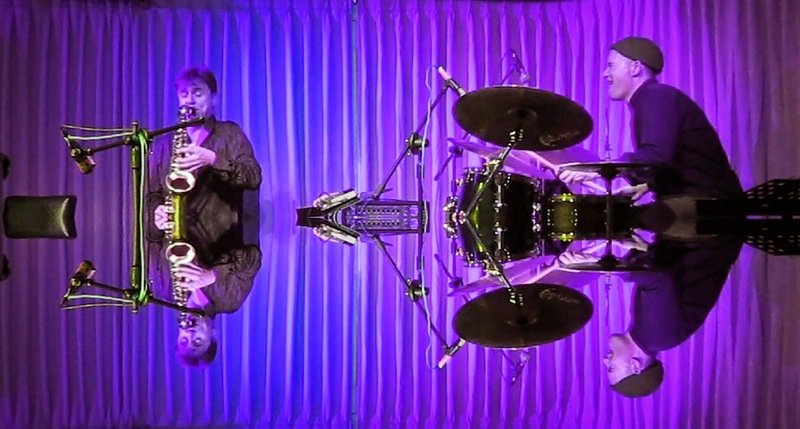 Climbing without ropes: A sax player and a drummer are exploring the chances and challenges of improvising in the duo format. German-born Klaus Bru on electrified C-saxes busies himself with whirling notes, minimal cries, orchestral noises, while American-born Sorensen on drums provides elegant, tricky, always groovy rhythms, at times as light as a spring breeze, at other times as threatening as a typhoon in midsummer. Aside from dramatic peaks and occasional noisy outbursts, their improvisations are thick with melodies that wander around and find back to their center.